A table is filled with food made from traditional ingredients: smoked salmon, beach-asparagus dip, berry jams and scones. High school students from the Tribal Scholars program are gathered, filling their plates. 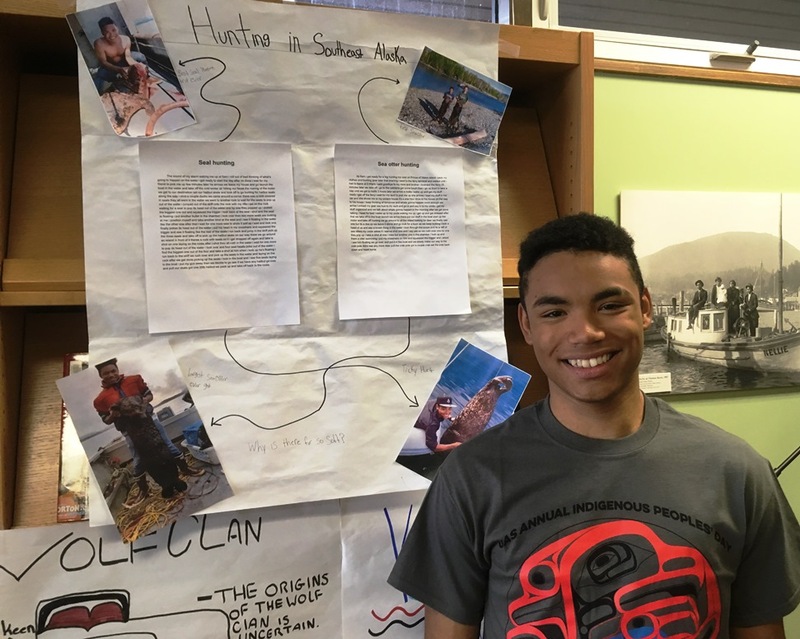 Those students, all Alaska Native or Native American, made posters that are hanging on the walls of the UAS Ketchikan Campus Library. Each poster represents Native culture, in any way the student chose. But, teacher Barbara Morgan said, it had to follow the theme of “Sense of Place,” and she made the assignment specific to science because that’s her area of specialty. Ronny Robert Pungowiyi is Siberian Yupik, and his poster is about seal and sea otter hunting. Pungowiyi said he learned the traditional hunting methods, and has been hunting since he was two years old. He said Indigenous Peoples Day to him means learning where he came from. Brooke Edenshaw said the day helps Alaska Natives be proud of who they are. Her poster focuses on the Kuspuk, a traditional Yupik garment worn by women. Edenshaw is Yupik, and said she has a couple of Kuspuks at home, but she’s outgrown them. In addition to the posters, some tables in the library display traditional items made by Alaska Native residents. Merle Hawkins makes all kinds of products from devil’s club. She said the formidable plant hides important traditional medicine under all those thorns. “I brought a fresh piece of devil’s club so they could see it, feel it, smell it, touch it,” Hawkins said. But, usually you don’t want to touch devil’s club. And how does she harvest it without hurting herself? 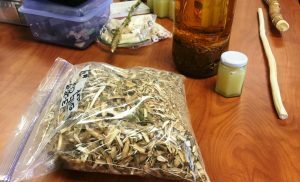 Hawkins said that green layer can be dried and used as a medicinal tea for arthritis or stomach problems. It also can be put in a jar with olive oil. After a while, the devil’s club bark infuses the oil with its medicinal qualities, and the oil can be used to make ointment and other products. Hawkins is Haida, and said local Indigenous people have been using devil’s club bark for thousands of years. They learned about it from watching bears rolling on the thorny plant. Hawkins said to her, Indigenous Peoples Day highlights the challenges Alaska Native have overcome, and their resiliency in maintaining their culture. Note: The Tribal Scholars program is a cooperative effort between Ketchikan Indian Community and the Ketchikan School District. 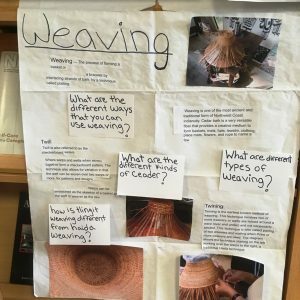 It provides an alternative education model with a focus on Alaska Native traditions.